Cyclopedia of Magic is a wonderful book. It's primary quality stems from its alphabetical organization. It was written to provide the magician with a wide and solid background of magical knowledge. It provides definitions, descriptions, biographies and some routines on hundreds of magic topics. 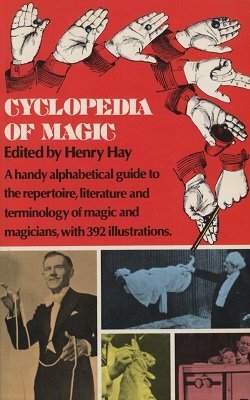 It is for the most part a compilation of material contributed by magicians such as August Roterberg, Charles Bertram, Eddie Joseph, Ellis Stanyon, John Mulholland, T. Nelson Downs and many others. The ebook starts with a User's Guide which describes the purpose of the book, and an index to the contributing authors. Animals: Short article with comments on Rabbits, Pigeons, Dogs, etc. Billet And Message Reading: article with discussion of the One Ahead, Impressions, Transparency, etc. Egg Bag: described, with some details of De Biere's egg bag. Includes a general approach to a routine, but no details. Hoods: as used for coins, cards, etc. Invention: article, includes a chart with Magical Technics, info on patents, etc. Mechanical Decks: Describes Strippers, Cornered, Forcing Decks, Svengali, Mene Tekel, etc. Organizations: SAM, IBM, Magic Circle, etc. Shell Game: briefly described, reader is directed to Jack Chanin's Hello Sucker! Silk Tricks: Describes various tools such as False Fingers, Wands, Production from a Match Box, Multiplying Tube, Productions, Color Changing, Knots, Sympathetic Silks, etc. String Tricks: Includes brief discussion of Perambulating String, Pricking the Garter, Snare, etc. Watch Tricks: Several tricks described including the Watch Mortar, The Watch Winder, and Watch It! Refers readers to Samuel Berland's Tricks with Watches. 1st edition 1949, 498 pages, 1st digital edition 2014, 425 pages.